The Tri-NOx Multi-Chem NOx Scrubber controls total NOx, NO2, and NO. This specification defines the design requirements, the quality and types of workmanship and materials and the performance standards and guarantees for the equipment materials and services supplied by Tri-Mer Corporation. 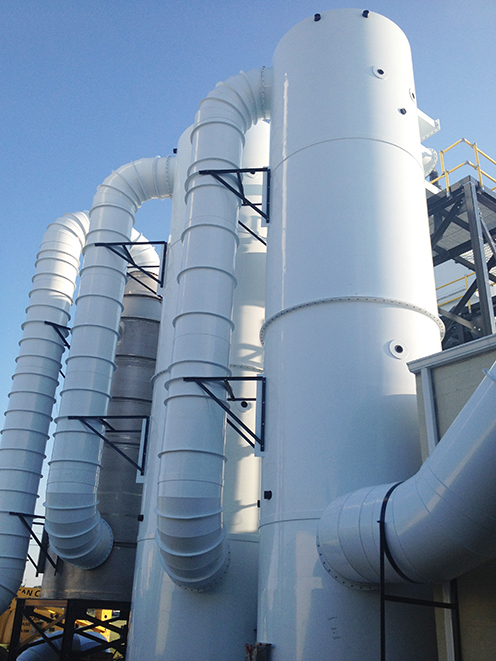 Tri-Mer Corporation furnishes all materials, labor, equipment, services, and incidentals required to provide an operable multi-stage NOx scrubber system. It is the intent of these Specifications to provide a complete and workable system that is ready for operation. The Contractor shall furnish all equipment and controls that are necessary to automatically maintain treatment chemicals at levels required to effectively remove contaminant gases and to minimize the possibility of breakthrough due to fluctuations in gas flow or concentration. The Contractor will install the equipment in accordance with the Manufacturer’s instructions and recommendations. Equipment to be furnished includes, but is not limited to: packed-bed scrubbers, oxidizers, recycle tanks, recycle pumps, chemical metering pumps, chemical storage tanks, instrumentation, control panel, motor control center, piping, and ductwork. All equipment is designed to be specially adapted for the intended service. All equipment is designed, constructed, and installed in accordance with the best industry standards, methods and practices. Scrubbers, oxidation towers, recycle tanks, and pumps are mounted on a coated steel frame. The frame includes platforms and ladders which allow access to components of the scrubber system for inspection and maintenance. The P&ID number identifies all valves and instruments. All materials of construction and hardware is resistant to attack by the compounds being absorbed and the scrubbing solutions. The NOx scrubber system is engineered to treat a specific cfm range of gas, within a specific temperature range. Further, the system is engineered to reduce the level of contaminants from a specific inlet concentration to a specific outlet concentration. Equipment is designed for continuous operation in a specific seismic zone and environment, with a specific mph wind load. Once these 7 parameters are supplied by the customer, design can begin. A portion of the scrubbing solution is purged from each recycle tank in order to prevent excessive accumulation of compounds, which could reduce efficiency of the scrubber or cause fouling. Make-up of evaporation and other water losses is accomplished by continuous or controlled water additions. Fresh water is added to the last recycle tank to create a purge stream, which flows through the scrubber system countercurrent to the direction of air flow. If there is a conflict between the codes or standards and these specifications, the standards prevail and an exception to the specifications should be noted. Drawings and other information describing the equipment is submitted for evaluation and approval. Equipment will not be purchased, fabricated, or installed without written approval by the Purchaser. Three complete sets of drawings and other information shall be submitted to the Purchaser for review. Tri-Mer Corporation must receive written approval of design before production begins. General arrangement drawings for each major assembly shall be submitted. The drawings include overall plan and elevation space requirements; clearance required for operation, maintenance, removal, or repair of components. A functional description of the control system covering operation, start-up, alarms, and emergency shutdown shall be submitted. The information which is furnished for equipment includes name of manufacturer, model number, quantity, dimensions, materials of construction, total shipping and operating weights, anchoring requirements, power requirements, performance curves, sequence of operation, and installation instructions. Address and phone for factory and local representatives. Each scrubber shall be a vertical, cylindrical vessel with domed ends. Air shall enter near the bottom of the scrubber and shall be discharged near the top. Scrubbing liquid shall be applied to the top of the pack and shall flow by gravity toward the bottom of the column. Scrubbers shall be complete, including all internals, packing, packing supports, mist eliminator, liquid distributors, air inlet and outlet, access doors, couplings or flanges for connection of instruments or plumbing, lifting lugs, anchoring lugs, and other appurtenances shown on the drawings, or as necessary for safe and efficient operation of the system. Vessels are polypropylene, PVC, FRP, or stainless steel. Packing is a random-dumped, high-efficiency type, fabricated from polypropylene, with a nominal diameter commensurate with the tower diameter. Packing is Tri-Pack, manufactured by Tri-Mer Corporation. The mist eliminator is integral to the scrubber and consists of several layers of polypropylene monofilament mesh pad material. The demister is six layers of Kimre Style 37/97 material. Scrubbing liquid is evenly distributed over the top of the packing by an arrangement of spray nozzles on one or more headers. Spray nozzles are a non-clogging, open-orifice type, easily removable for cleaning and attached to the header with tees. Access doors are provided at the top and bottom of the packing section to facilitate removal and replacement of the packing. An access door is provided for inspection of and access to the mist eliminator. At least one (1) access door is provided to facilitate observation and maintenance of the spray headers. All access doors are a flanged opening with diameters as shown on the drawings. They are located away from obstructions such as ladders, piping, and ductwork. The Manufacturer will provide clear flange covers, gaskets, and hardware. Gaskets for all flanged fittings or access doors are 1/8-inch-thick full face type made from ethylene propylene rubber (EPR). A minimum of three lifting lugs are required. Pipe supports for the recycle line are attached to the vessel. Each oxidation tower is a vertical, cylindrical vessel with domed ends. Air enters near the top of the tower and is discharged near the bottom. Oxidation towers are complete, including all internals, mist eliminators, liquid distributors, air inlet and outlet, access doors, couplings or flanges for connection of instruments or plumbing, lifting lugs, anchoring lugs, and other appurtenances shown on the drawings, or necessary for safe and efficient operation of the system. The vessels are filament wound glass-reinforced plastic construction. The resin is a vinyl ester type. Oxidizer suspension pads are provided at two locations in each tower to retain chemicals sprayed into the gas stream to oxidize nitric oxide. The pads consist of several layers of material, constructed from polypropylene or PVDF monofilament. The pads are six layers of Kimre Style 37/97 material. The mist eliminator is integral to the scrubber and consists of several layers of mesh pad material constructed from polypropylene monofilament. Oxidizing chemicals are evenly distributed over the top of the suspension pads by an arrangement of spray nozzles on one or more headers. The entire liquid distributor is PVC. Spray nozzles are a non-clogging, open-orifice type. An access door is provided for inspection of and access to the mist eliminator and each oxidizer suspension pad. An access door is provided to facilitate observation and maintenance of the spray headers. Access doors are flanged openings with dimensions as shown on the drawings. They are located away from obstructions such as ladders, piping, and ductwork. Clear flange covers, gaskets, and hardware are provided. 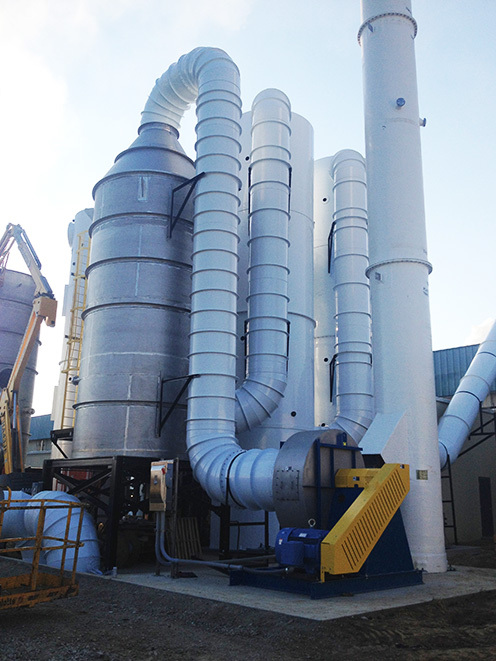 A tank is furnished for each reduction stage so that scrubbing solution may be re-circulated through each scrubber. The overflow tank receives liquid purged from the scrubbers and oxidation towers. Each tank is a vertical, cylindrical vessel with flat bottom and domed top. Tank capacity provides for a minimum of two-and-a-half times the recycle rate. The tanks are of filament wound glass-reinforced plastic construction. The resin is vinyl ester type. Tanks are supplied with access doors, couplings or flanges for connection of instruments or plumbing, lifting lugs, anchoring lugs, and other appurtenances shown on the drawings, or necessary for safe and efficient operation of the system. Horizontal end-suction centrifugal pumps deliver scrubbing solution from the recycle tank to the spray nozzles in the scrubber, and discharge effluent from the overflow tank. Optional redundant pumps can be provided. Each pump is sized to handle the entire flow required for proper scrubber operation. Pumps, drivers, and auxiliaries are suitable for start-up and continuous operation in an outdoor, totally unprotected environment, and at any temperature within the design range. Pumps are top-discharge, self-venting design with fully confined gaskets. Suction and discharge connections are 150# standard ANSI flanges. An arrow indicating direction of rotation is permanently attached to the pump housing. Mechanical seals, as manufactured by Durametallic, John Crane, or Borg Warner, are furnished. Pumps are FRP or stainless steel ANSII design, or approved equal. Tanks for the storage of treatment chemicals that are necessary for the proper operation of the system can be optioned. Chemical storage tanks have flat-bottom, cylindrical construction with dome or conical top. They are fabricated from filament wound glass-reinforced plastic. The resin is vinyl ester type. Each tank is flanged connections for filling, overflow, pump, sight gauge, vent, drain, and level switches. Motors conform to the latest revision of NEMA standard publications MG1 and MG13. Motors are standard foot-mounted type with rigid base design. They are NEMA design B (normal torque). Motors are for continuous duty and have TEFC (totally enclosed, fan-cooled) enclosures. Motors are manufactured by Lincoln Electric Company, U.S. Motors, Baldor, or approved equal. Recycle lines are Schedule 80 PVC or CPVC, valved so that the pump can be removed for maintenance without draining tanks and sump. Basket strainers to prevent objects from entering the pump suction can be optioned. The strainer has flanged inlet and outlet couplings. The basket has 3/16-inch diameter holes. The top of the strainer is flanged to allow access to the basket for cleaning. The purchaser may option an electrical power and control system. A single control panel for the entire scrubber system is provided in a NEMA 4 enclosure. Internal components are pre-wired. A programmable logic controller controls system functions. The programmable controller is mounted within the control panel enclosure. PLC is Allen Bradley or equal. A programmed system start-up sequence is provided. It is initiated from a selector switch mounted on the door of the control enclosure. An optional continuous emissions monitor is furnished to measure concentrations of nitric oxide (NO) and total NOx, and to calculate nitrogen dioxide (NO2). The emissions monitoring system is Horiba Instruments Inc. Model ENDA-4120, or approved equal. If optioned, the Contractor provides all labor, equipment, and utilities necessary for start-up. The equipment supplier furnishes the services of a factory representative, who has complete knowledge of the system and its components, to inspect the final installation, to supervise initial operation, and to train operating personnel in the proper operation and maintenance of the system. Training sessions cover: system overview, safety procedures, system operation, maintenance, and troubleshooting. In addition to the standard supplied components, the purchaser may choose to option components to add to the package.